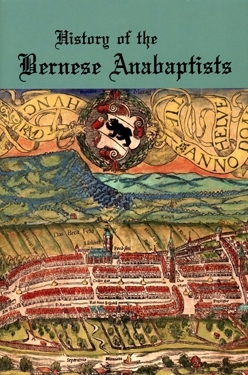 We’ve got a winner today of last week’s History of the Bernese Anabaptists contest. As you’ll recall, the book was written in German by Ernst Müller and published in 1895. It waited over a century for its first English translation, a task which John Gingerich took on a few years ago. I’ve done a bit of translating from Polish to English, which I’ve found painstaking at times. Words might not have a direct translation, in some cases you might have to deduce an author’s intended meaning, and so on. So anytime I hear about someone translating a full book, I’m impressed (not to mention one written in a different era). Fortunately, I had a great support group! John Roth and Joe Springer of Goshen College encouraged me to begin the project, and were always available to answer questions and offer advice and critiques. Leonard Gross, also of Goshen, proofread some of the material and also readily answered my many questions. Prof. Urs Leu of the Zentralbibliothek in Zurich, Switzerland, was especially helpful in answering questions about archaic Swiss German phrases. In addition, my good friends Nancy and Dieter Huth of Middlefield, OH, and Max Güngerich and Therese Güngerich of Canton Bern, Switzerland, proofread and critiqued my attempts to translate the book. All four are retired teachers, and without their help and guidance, I would have quit right after the first chapter. Fortunately, we all got along and worked very well together during the 2.5 years we worked on the translation. They also enjoyed making good-natured fun of my (numerous) mistakes. Ultimately, Joseph Stoll and David Luthy of Pathway Publishers, provided continual encouragement and feedback. Even after 2.5 years of translating, it took another year of working with Joseph Stoll on the editing, and David Luthy on design, to complete the book. They taught me a lot about book production, and made the book so much better. Well there you have it. Quite an international and intercultural team. You may recognize the names Joseph Stoll and David Luthy, also of the Plain publication Family Life. Congrats Char. Send me your address (ewesner (at) gmail (dot) com) and we’ll get your copy to you. If you didn’t win, you can get a copy of the book here. Thanks again to John for the great interview and providing a book for the contest. We’ll be having another book giveaway on Thursday, so be sure to be here! I’ll keep you in suspense as to what book it is, but I think you’re really going to enjoy the interview. The book sounds so interesting – I am looking forward to buying a copy. I sympathize with you and John Gingerich, Erik – a lot of my seminary work was Greek and Hebrew translation, although I could always proof my work against the authorized text. I was honoured to work on a translation project of Luther’s work in Latin into modern English, with my German-speaking professors. The work had been previously translated into(archaic)High German, but my professors did not speak English well enough to make the transitional translation. It was something of a polyglot project, as they spoke better Spanish than English, so sometimes the work had to pass through a middle phase in yet another language. Congratulations Char for winning the book!! I am sure you will enjoy it. I hope to purchase a copy after I get moved the end of August. Speaking of which after next week I will be hit and miss online until I am completely moved as I am moving my computer next Friday. I will miss you all when I am not online and will try to get caught up when I have the time. The translator probably stayed motivated for so long because he was having lots of fun. My husband and I knew Hugh Gingerich, a brilliant mathematician, who studied Amish genealogy in his spare time. He published a book, AMISH AND MENNONITE GENEALOGY. He had fun doing this, although it must have been quite a challenge. Not only did he have to contend with a small number of surnames, but he also had to contend with handwriting styles and variant spellings. One difficulty he mentioned was that the nicknames for Margaret and Rebecca (Peggy and Becky) were hard to tell apart. Congrats Char. I too plan on buying a copy of this book when I can. Good luck on the move Alice Aber. I will be moving my daughter in about three weeks from Auburn, Al where she has been in graduate school for the past 3 years either back to Texas, or if she gets the job she is praying for, to Wyoming. Do yu know how hard it is to plan a move when you don’t know within a thousand miles what the final destination is? Prayers for her, Sara’s employment would be greatly appreciated. Thanks OldKat for the well wishes. I will be fine, my move this time is just across town to stay with a friend until I can get on my feet. I do have a lot of stuff to go through and get rid of what I can not keep or no longer need though. I will keep you and your daughter Sara in my prayers. Yes I truly do know how hard it is to plan for a move when you are not totally sure which direction you are going. Several years ago I worked for Pinkerton Security and was being transferred, it was going to be one of two places about 1500 miles apart,,,, I did not know which direction I was going until about 4 days before I had to be there. Ugh, that was a nightmare!! I was also moving a 3 bedroom house full of furniture. Not fun!! But I managed and so will you and your daughter. God has a way of making things work out for the best. Congratulations to Char for winning the book, and many thanks to those who purchased a copy! Although it was hard, frustrating work at times, we did have a lot of fun, especially with some of my more hilarious mistakes. For example, the gothic German “R” and “K” capital letters look somewhat similar, especially when reading quickly. Thus, I once misread “Rinder” (cattle) as “Kinder” (children), when the book referenced a plague in a certain region. That resulted in some good-natured teasing! Thank goodness for proofreaders and editors! John, I don’t know what kind of mistake happened, but I can imagine. I hardly ever win ANYTHING!! I am truly looking forward to reading this. I enjoy this sites and am enriched by everyone’s comments. Thanks again!